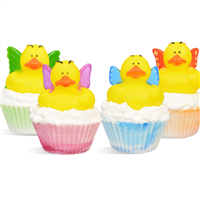 These soap cupcakes are screaming "here comes spring"! 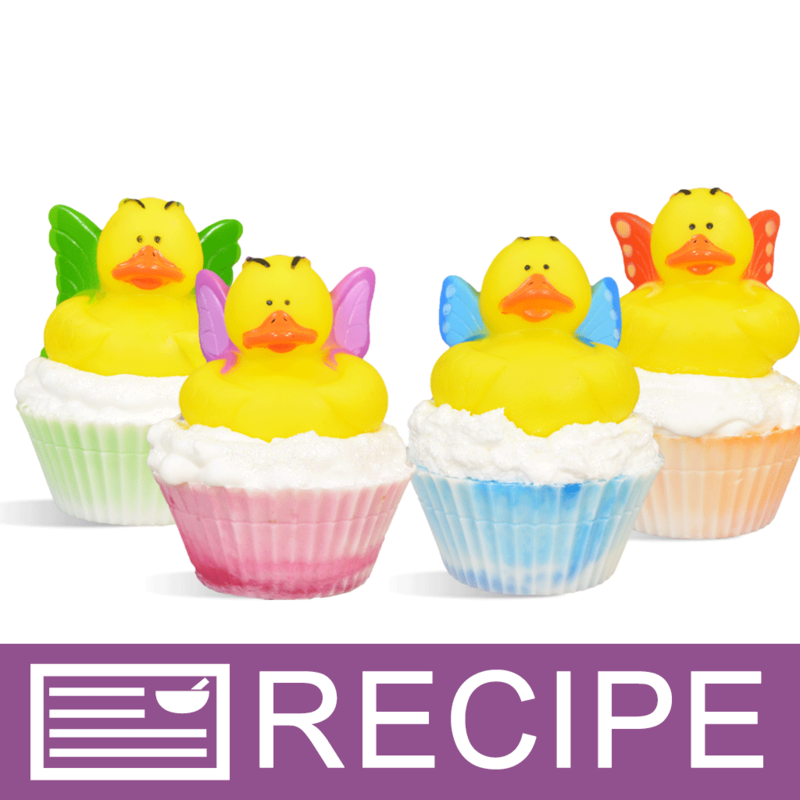 The cute butterfly ducks look adorable atop these soap cupcakes and will also make a fun toy to play with later. The fragrance of Candy Crush combines sweet banana and juicy kiwi blended with lemon sugar and vanilla to make this a sure winner for both kids and adults. Lay cupcake liners out onto a cookie sheet. To plastic beaker, mix 0.20 oz. fragrance with 0.10 oz. vanilla stabilizer. Let sit for at least two minutes. To microwave-safe measuring cup, add 4.5 oz. cut up white soap. Heat in microwave just until melted. To a second microwave-safe measuring cup, add 3.0 oz. cut up clear soap. To this cup, add 0.10 oz. of first color block. Heat in microwave until melted. Stir soap until blended. Let soaps cool to around 140°F. Add fragrance mixture to white soap and stir well. Each color of soap will fill three cupcake liners. Take one cup in each hand and pour white and colored soap together into first cupcake filling to the top. Pour soap into second and third liner. Using the end of a spoon, gently swirl soap around a few times to get a tye-dyed look. Spritz with rubbing alcohol and let harden. Repeat above steps with next three colors and let all soap harden. Can be placed into refrigerator to harden soap more quickly. Remove from liners and set aside. To large microwave-safe mixing bowl, add 8 oz. cut up white soap base. Heat in microwave until melted. Add Foaming Bath Whip and stir into melted soap to soften. Using a hand mixer, whip ingredients until mixture starts to thicken. In small glass bowl, add glycerin and myristyl myristate. Place in microwave and heat on low heat just until melted. Stir to blend. In plastic beaker used earlier for fragrance, mix 0.50 oz. fragrance oil with 0.25 oz. vanilla stabilizer. Let sit for 2 minutes. Begin to whip product, then add glycerin mixture. Be sure to scrape sides of bowl with spatula. Add fragrance mixture and whip on medium-high until frosting starts to thicken. Let mixture sit for 5-10 minutes and let cool. If necessary, place bowl in refrigerator to cool and thicken. Place a decorating tip of choice into decorator bag or plastic food bag. Cut off tip of bag and push the decorator tip through so it is sticking out of the bag. Fill with soap frosting. Pipe frosting around the outer edges of cupcake, making a double layer. Leave a hole in the middle for the duck. 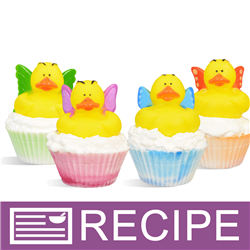 Sprinkle with a small amount of glitter then place duck into the middle of cupcake pressing down so it sits in the frosting. Continue in this manner until all 12 cupcakes are decorated. Let completely harden. Frosting should be hard enough to package after 24 hours. Package one soap cupcake in a cello bag and tie with coordinating ribbons. Ingredient Label: CUPCAKES: Sorbitol, Propylene Glycol, Sodium Laureth Sulfate, Stearic Acid, Myristic Acid, Water, Sodium Hydroxide, Sodium Cocoyl Isethionate, Titanium Dioxide, Fragrance, Mica, Titanium Dioxide, Iron Oxide, Tin Oxide, Chromium Oxide Green, Ultramarine Blue. FROSTING: Sorbitol, Propylene Glycol, Glycerin, Water, Sodium Laureth Sulfate, Sodium Cocoyl Isethionate, Stearic Acid, Lauric Acid, Sodium Hydroxide, Myristyl Myristate, Sodium Chloride, Fragrance, Titanium Dioxide, Diazolidinyl Urea, Iodopropynyl Butylcarbamate, Glitter. "What could can be used in place of the myristyl myristate?" Staff Answer You can use Palm Kernel Flakes in place of the myristyl myristate for the soap frosting. "Is the soap frosting here a better alternative or the same to the one using Palm Kernel Flakes - 102º Melt? I have had issues with that soap frosting recipe and had to add a lot more of the palm kernel flakes in order for it to harden enough to ship. I have been interested in an alternative and this looks similar :) Thanks"
Staff Answer This is a palm-free alternative to the flakes. It hardens about the same as the flakes do. This frosting hardens enough to ship, we feel. It is not hard like Royal Frosting. We have heard others add a little stearic acid to the frosting to make it harder.